One year. I know it’s been said, and sounds awfully trite, but it doesn’t seem like one year at all. It seems both much more and much less. Much more because my life before this seems so very far away. Much less because I feel like this first year, with all its adventures, sped past me no matter how hard I tried to pull the reins in a bit. Before I go, I leave you with (as promised) the first dish I tried from Chocolate & Zucchini. I was drawn to this dish as it showcased only a few flavors, letting each shine and complement the other. I had also come across some French beans in the market that were calling my name! This isn’t Clotilde’s exact recipe as I reduced it to feed only two (something I usually have to do with most recipes). I also didn’t have any parsley (the original does and I’ll be sure to add it in next time). I didn’t have any pecans either, so I substituted walnuts (which Clotilde indicates is a fine substitution). 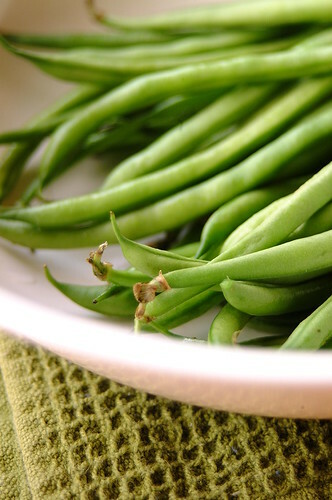 – Steam the beans for 8-10 minutes, until just cooked through and still crisp. Plunge in cold water (to stop cooking) and drain. – In a salad bowl whisk the oil and vinegar together. Add salt and pepper (remember that you will be adding ham later, which is also salty, so don’t overdo it). – Add beans (and parsley if you are using it) and toss gently to coat with dressing. Adjust seasoning. – Arrange ham and nuts over the beans. You may serve this immediately or refrigerate for a day, just remove it from the fridge half an hour before eating. I was rushing around so I removed it only right before we were going to eat, so we had it chilled. In this heat it was actually perfect that way. Cool and crisp and refreshing. This salad is so easy to whip up, but its taste is much more luxurious then its simplicity belies. 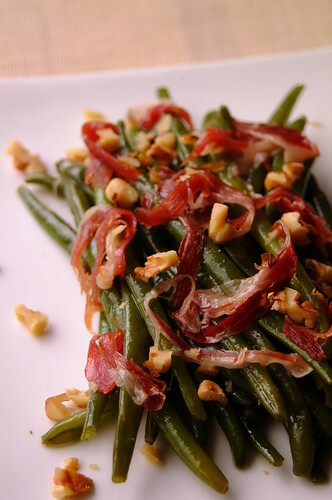 The fresh crunch of the beans with the zing of the dressing just barely clinging to it, the earthy walnuts, and the silky-salty rich jamon…the combination is delicious! « Chocolate & Zucchini – The book!